I wanted to complain that in FTB's newest kitchen sink pack that Profile wasn't working for anything higher than 100 chunks, the height ceiling was capped, Mining World was scanned twice and others weren't scanned at all, blah blah blah. Then I saw that you had made some changes to the github repo, so I used my energy to learn how to compile your code and voila! JER works like a dream; now I am going to see if this version can handle the 10k chunks profile scan in FTB Revelations without blowing up my minecraft. :X The GitHub version is much better and haven't ran into any problems yet; not sure I'm qualified to Q/A your code since I spent all night just trying to scan lol. 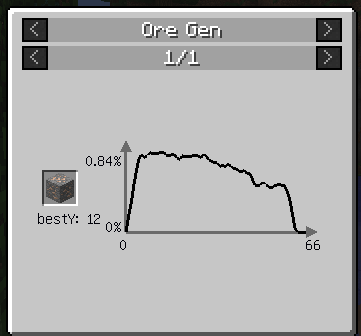 Suggestion: An average block count per chunk in the ore graph, accurate to 1-2 decimals. The graph is a great visual for distributions, but it doesn't easily translate to actual ore counts. This feature should probably be optional, and maybe even disabled by default. I only had the idea because manually calculating and balancing custom ore generation is time-consuming and tedious. 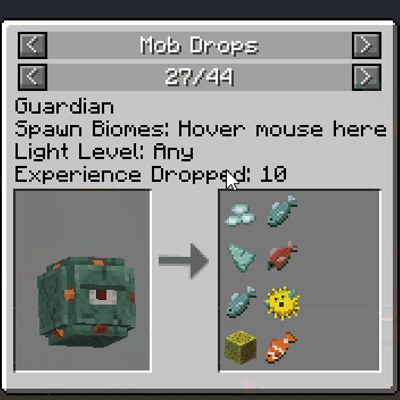 There's a problem, though: The default mob drop information is wrong if any mods alter mob drops. It doesn't seem to update automatically, and I can't find a way to change it. I don't know how feasible it is, but IIRC, Woot perfectly simulates mob drops without spawning any actual mobs, so it must be possible. This issue has indeed been lingering around on the tracker. But I don't really have the free time to fix that in the near future. does this mod show only vanilla stuff or every mod that is in the mod pack? Most of the features work for all mods in the pack, for the ore gen you will likely have to profile a world. i have a question when i'm profiling my world it gets stuck on some worlds what can i do about it? I'm playing on the All The Mods 3 pack and I'm trying to use the profile command to generate oregen for the Deep Dark and Mining World. When I use the command it will always get to [ExtraUtils2_Quarry_Dim] Started profiling and just not profile anything else or finish. I usually keep the chunk total small 4-16, and it doesn't take that long to profile dimensions. Is it because that the EU2 quarry dim isn't a normal dimension and is only one random regenerating chunk? Is there anyway to exclude this dimension from the profile command? Sorry to necro this, but what was your solution? Oh man, I’m pretty sure what I did was going to each dimension I was using and using the profile command without ‘all’ the end of it. But when I did that it would substitute my previous profile with that so I would have to go into where the profiles are saved and used a text editor to combine them manually. I’m pretty sure this isn’t the correct way, but it worked for me. Hope this helps. What about IC2 ores? Can i myself add mods ores? Either they have to add support on their end or you could do an ore profile (kinda advanced tho, see bottom of the description).